For all those (myself included) requiring an introduction to David von Schlegell’s art, the sculpture Five Birds and its attendant Untitled Study for Five Birds (both 1988) greeted visitors at the entrance to his exhibition. Birds in flight, cobbled from shards of aluminium tube and hanging on monofilament, cast fluttering shadows over the cut-paper studies on the wall behind. These were far from the most sophisticated works in the show, but they announced, for the uninitiated, the artist’s fascination with dichotomies of form and weightlessness, land and air, the man-made and the natural. The five untitled maquettes included here cannot do justice to what was surely most striking in the final sculptures: their towering scale and their nuanced interaction with their settings. Two models for Pilot’s Memorial (1983) at Tulsa Airport, from 1979 and 1983, hint at the shifting viewpoints presumably available to passing aircraft passengers. Here, the simple wood and metal constructions looked rather quaint. Two tall steel poles with arcing feathered ends – a sculpture realized at Storm King in 1969 represented here by a table-top maquette and a scale drawing – belie the complex spatial dynamics they must have exerted at full size. The heart of the exhibition beat, however, in the monochrome paintings that the artist made in his final years by pouring oil paint mixed with polyurethane onto sanded wooden panels. Seven of these were large – 122 centimetres square – while three smaller works suggested studies. Although Von Schlegell’s layering of colour evokes the 1960s experiments of West Coast Light and Space artists, such as Ron Cooper, there was nothing fetishistic about his finishes. While in places his surfaces seem endlessly (and effortlessly) deep, at their unevenly hemmed edges the viewer is awakened to the simple liquid facts of the paint’s application. In others, specks of dust caught in the wet paint create the illusion of bubbles rising through deep water or comets streaking through space. Grey Towards Violet (sic) (1991), for instance, captures the smoky quality of early photography. Certain of the paintings added to this impression with bands of stained brown plywood at either side, which brought to mind 19th-century cameras or photographic plates. 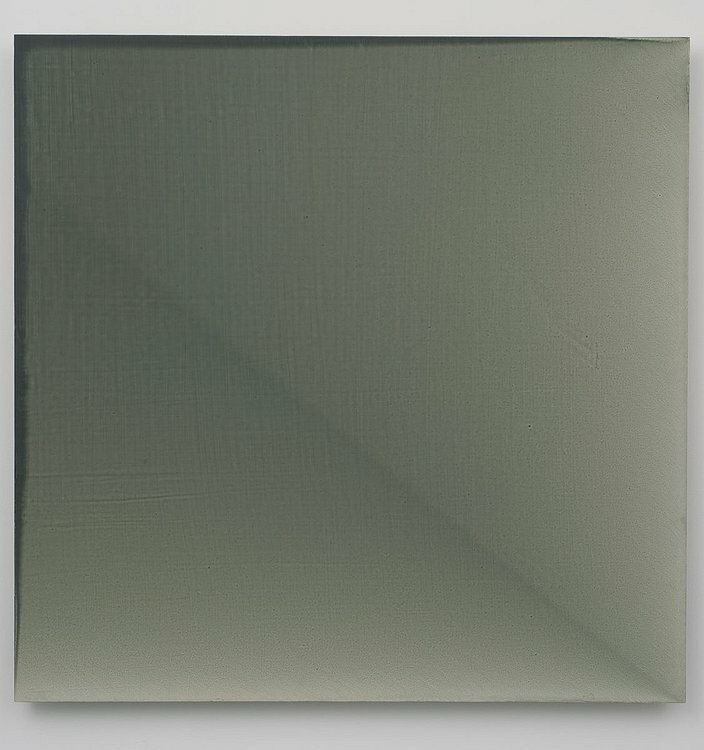 Although made 20 years ago, these paintings have an affinity with the abstract, camera-less techniques of contemporary artists such as Liz Deschenes. Von Schlegell was, first and foremost, a sculptor; these objects, though we might call them paintings, speak more about physical construction than pictorial affect. Which makes it all the more surprising that many of them contain seams of dark colour that run diagonally across the panels from a lower corner – created by tilting the surface as the paint dried – thus introducing a whisper of illusional perspective. The squares could almost be pictures of rooms or tunnels receding into darkness. Even at the end of his life, it is clear that this unpredictable artist was unafraid of doing the very thing least expected of him.